Ready-made recombinant monoclonal anti-idiotypic antibodies, highly specific for the humanized antibody drug palivizumab (Synagis®). The Type 1 anti-palivizumab antibodies inhibit the binding of the drug palivizumab to its target, a highly conserved region on the F protein of respiratory syncytial virus (RSV), and therefore detect free drug. These antibodies are ideal for use in indirect ELISA, to develop pharmacokinetic (PK) bridging assays and as a reference standard for anti-drug antibody (ADA) assays. These recombinant monoclonal antibodies are generated using the HuCAL® antibody library and an improved proprietary method of phage display, which results in highly specific and sensitive reagents. These are ideal for PK and PD assays. Antibodies are fully human, so they are also perfect as controls or calibrators for ADA assays. 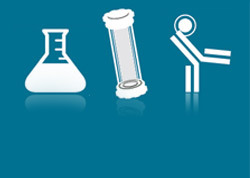 The in vitro production of recombinant antibodies means that there is a consistent, secure supply throughout preclinical development and clinical trials, avoiding the need to develop new reagents. 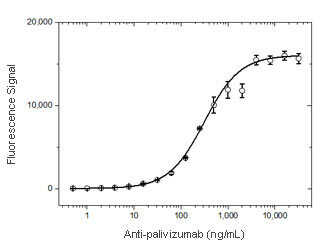 Figure 1: Anti-palivizumab antibody, clone AbD23967 (HCA261) was coated on a microtiter plate at 1.0 µg/ml and left over night. Washing and blocking was performed with PBST + 5% BSA. 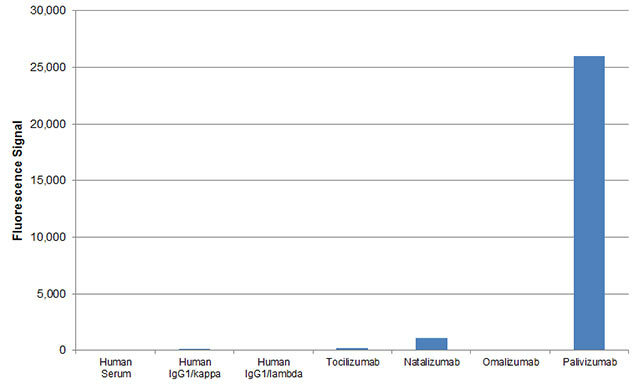 10% human serum was added and spiked with increasing concentrations of palivizumab. Detection was performed using HRP conjugated anti-palivizumab antibody clone AbD23967_hIgG1 (HCA262P) diluted to 2 µg/ml in HISPEC buffer (BUF049A), plus QuantaBlu™ fluorogenic peroxidase substrate. Data are shown as the mean of three measurements. 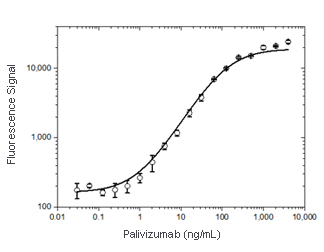 Figure 2: Palivizumab was coated at 0.5 µg/ml on a microtiter plate overnight. After washing and blocking with PBST + 5% BSA, PBST with 10% human serum was added spiked with increasing concentrations of the human anti-palivizumab antibody clone AbD23967_hIgG1 (HCA262). Detection was performed using HRP conjugated palivizumab at 2 µg/ml in HISPEC assay diluent and QuantaBlu fluorogenic peroxidase substrate. Data are shown as the mean of three measurements. HRP conjugation of palivizumab was performed using a LYNX Rapid HRP Antibody Conjugation Kit®. Figure 3: A microtiter plate was coated over night with various antigens at a concentration of 5 µg/ml. After washing and blocking with PBST + 5% BSA, detection was performed using anti-palivizumab antibody (clone AbD23967, HCA261) at a concentration of 2 µg/ml followed by an HRP labeled anti-DYKDDDDK tag antibody in HISPEC diluent and QuantaBlu fluorogenic peroxidase substrate. HuCAL® is a registered trademark of MorphoSys AG. QuantaBlu™ is a trademark of Thermo FisherScientific. Synagis® is a registered trademark of the AstraZeneca group of companies.